This book is the perfect solution for those involved or interested in the operation of wireless devices, networks, and service providers. This reference book explains the latest technologies and applications used in the wireless industry, assists with the explanation of technologies by using many diagrams and pictures. It is a great reference tool that allows people to effectively communicate with other people involved in the wireless industry. Althos recruited 12 wireless voice, data, and video experts, each with specific knowledge of wireless telecom technologies and business practices. 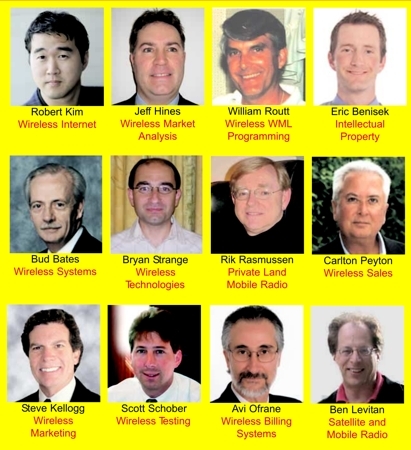 This team, together with input from over 1,025 other online contributors gathered, added, and edited what are now the latest Wireless, telecom, and data network terms and acronyms in use today. Wideband code division multiple access is a 3rd generation mobile communication system that uses code division multiple access (CDMA) technology over a wide frequency band to provide high-speed multimedia and efficient voice services. The WCDMA infrastructure is compatible with GSM mobile radio communication system. WCDMA provides for high-speed data and voice communication services. Installing or upgrading to WCDMA technology allows mobile service providers to offer their customers wireless broadband (high-speed Internet) services and to operate their systems more efficiently (more customers per cell site radio tower). The WCDMA system is composed of mobile devices (wireless telephones and data communication devices called user equipment - UE), radio towers (cell sites called Node Bs), and an interconnection system (switches and data routers). The WCDMA system uses two types of radio channels; frequency division duplex (FDD) and time division duplex (TDD). The FDD radio channels are primarily used for wide area voice (audio) channels and data services. The TDD channels are typically used for systems that do not have the availability of dual frequency bands. This figure shows a simplified functional diagram of a WCDMA network. 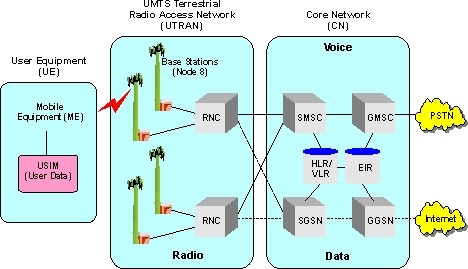 This diagram shows that the WCDMA system is composed of 3 key parts; the user equipment (UE), UMTS terrestrial radio access network (UTRAN), and a core interconnecting network. The UE is divided into 2 parts, the mobile equipment (ME) and the UMTS subscriber identity module (USIM) card. The UTRAN is composed of base stations (called Node B) and radio network controllers (RNCs). This example shows that the RNCs connect voice calls to mobile switching centers (MSCs) and connect data sessions to packet data service nodes (PDSNs). The core network is basically divided into circuit switched (primarily voice) and packet switched (primarily data) parts. The core network circuit switch parts contain the serving MSC and a gateway MSC. The serving MSC (SMSC) connects to the UTRAN system and the gateway MSC (GMSC) connects to the public telephone network. The core network packet switched parts contain the serving general packet radio service (GPRS) support node (SGSN) and a gateway GPRS service node (GGSN). The SGSN connects to the UTRAN system and the GGSN connects to data networks such as the Internet. Bluetooth is a standardized technology that is used to create temporary (ad-hoc) short-range wireless communication systems. These Bluetooth wireless personal area networks (WPAN) are used to connect personal accessories such as headsets, keyboards and portable devices to communications equipment and networks. The Bluetooth system can dynamically discover and connect to other nearby devices (if the devices are setup to be discoverable). To setup a Bluetooth system, one of the devices is designated as a master (controlling) and the other devices are setup as slaves (responding to the commands of the master). When a small Bluetooth system has been setup, it is called a Piconet. This diagram shows how a Bluetooth system can connect multiple devices on a single radio link. This diagram shows that a laptop computer has requested a data file from a desktop computer. When this laptop computer first requests the data file, it accessed the Bluetooth radio through a serial data communication port. The serial data port was adapted to Bluetooth protocol (RFComm) and a physical radio channel was requested from the local device (master) to the remote computing device (slave). The link manager of the master Bluetooth device requests a physical link to the remote Bluetooth radio. 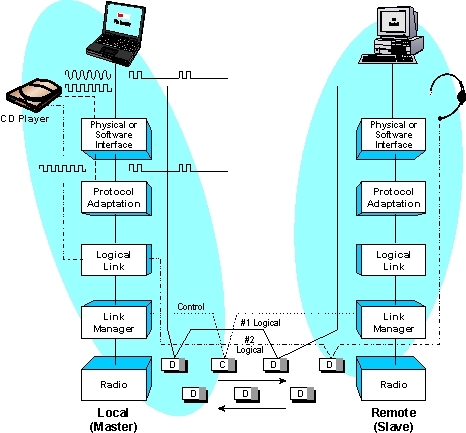 After the physical link is created, the logical link controller sends a message to the remote device requesting a logical channel be connected between the laptop computer and the remote computer. The logical link continually transmits data between the devices. In this diagram, the user then requests that a CD Player send digital audio to a headset at the remote computer. Because a physical channel is already established, the logical link controller only needs to setup a 2nd logical link between the master Bluetooth device and the remote Bluetooth device. Now data from the CD ROM will be routed over the same physical link between the two Bluetooth devices. Mr. Lawrence Harte is a communications expert with over 29 years technical and business experience. He has authored over 80 books and is an inventor of several communication patents. His many degrees and certificates include an Executive MBA from Wake Forest University and a BSET from the University of the State of New York. A leader in business and technology, Dr. Kalaichelvan has over 20 years of experience as an executive in the communications industry. Since founding EION in 2001, Dr. Kalai Kalaichelvan has grown the business to become a world leader in broadband wireless networking solutions and a pioneer in WiMAX product development. Kalai's knowledge of the industry has led him to speaking engagements at the World Bank and the title Innovator of the Year from the National Research Council and the CATA Alliance. To ensure this dictionary contains the latest definitions, 15 experts were used from different sectors of the wireless industry to add and edit definitions. Many of the definitions were created using our technical books that have been edited by hundreds of industry reviewers. Diagrams and pictures in the dictionary assist the understanding of technical terms by providing functional and operational views.